Please call with questions on our Amish Lexington Kitchen Island with One Drawer and Two Doors or browse all our kitchen islands to find the perfect fit for your kitchen. This kitchen island is a great choice for a small kitchen. Customize our kitchen islands if you need a larger or smaller size. The base or top can be customize to fit your needs. Our standard options all you to choose to order the base only, upgrade to one of our top styles, the wood for the base and top, finish for base and top, distressing package, top thickness and inside cabinet customization. 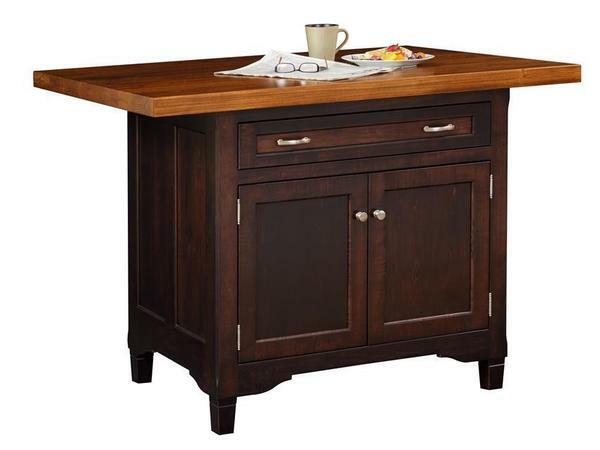 The kitchen island base is shown in a brown maple wood with a onyx finish. The island top is made from planks of elm wood with our popular Michaels Cherry finish. Base is Shown in a Brown Maple Wood with a Onyx finish. The Top is made from Planks of Elm Wood with Michaels Cherry finish. Just received our Kitchen Island this morning and it's wonderful!!!! It is also Antique RED which was the color we had chosen. We are very pleased with our experience with you both and your company, the island is sturdy, well-built and of very high quality, plus it's gorgeous! Thank you both for all your help!! The design is perfect - the soft close drawer is great for keeping silverware in. I ordered mine with the double pull out shelves and I could not be more pleased. Perfect for holding pots and pans and keeping them easily accessible.